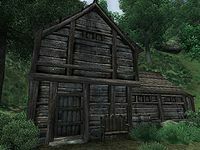 The Roxey Inn is an inn on the Red Ring Road, northeast of the Imperial City (quest-related). The publican, Malene, buys potions and food while only selling the latter. The ground floor contains a reception area consisting of a counter and a dining room, while the rooms are upstairs. There is also a free bedroll outside, around the back of the inn. The first time you ask Malene about Rumors, she will mention a strange village northwest of her tavern, Aleswell. The conversation subject Aleswell will then appear in your dialogue options; asking her then about the village will add the "Zero Visibility" quest to your journal. In fact, the village of Aleswell is due west of the Roxey Inn. Claude Maric, S'razirr, Rigmor and Brucetus Festinius, from the Nothing You Can Possess quest, can be found here if you haven't yet initiated the quest. One of the regulars, Pranal, is the Heavy Armor Master Trainer. The chest in your room won't reset after 72 hours and can be safely used for storing items. However, items retrieved may become marked as stolen. Be wary of getting either S'razirr, Rigmor, or Brucetus Festinius angry with you in the Roxey Inn. Because of their high aggression, they will attack you in the cramped space. And if anyone likes you enough in the Inn, they will join you in the fight, which will most likely end up with a few casualties. The guards who patrol the stretch of road due east and west turn around directly in front of the inn. Esta página foi modificada pela última vez à(s) 13h36min de 1 de junho de 2015.